Simon Pegg and Edgar Wright's Cornetto Trilogy has had some really stellar movies: Shaun of the Dead, Hot Fuzz, and now The World's End. 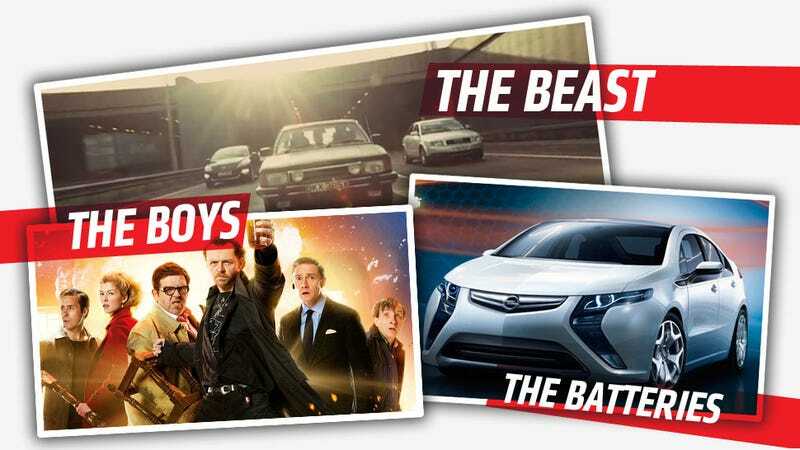 What's especially interesting about the most recent movie, The World's End, is how much content is conveyed through the use of cars. Oh, and don't worry, there's nothing really spoilery here. No ruined movies for you! There's two primary types of cars used to further the story in the movie, one blatantly and one more subtly. The first, is, of course, the main character's 80s-era Mk2 British Ford Granada, named "The Beast." It's was a vaguely bad-boy car to have for a young man in the early 90s, but now it's just a loud, filthy, outdated and dated old heap. Which makes it by far the most desirable car in the movie. It's a perfect analogue for the main character as well, Gary King, an aging loser who never managed to move beyond his brief heyday in the early 90s. That use of the car as something to develop/enhance a character is pretty obvious, but it works well. The other car is used in a much more subtle, if relentless, way. It's actually not one car, but many cars of a particular model: the Vauxhall Ampera, which we here in the states know as a Chevy Volt. Amperas are seen throughout the movie, and with the exception of one very noticeable billboard, aren't really called attention to. But if you actually start looking around the environment of the movie, it becomes clear that Amperas are in almost every scene, increasing in number as the movie progresses. The movie is essentially a body snatchers-type invasion movie. That's all obvious from the trailers, so nobody send angry comments about how I ruined your date night with your RealDoll or whatever. These alien androids are replacing humans in the town in the movie, and the implication is that these alien androids are more rational than humans, more efficient, and generally just do things better. Is that getting spoilery? I hope not. The Amperas appeas wherever the anrdroids are. When android concentrations get high enough, there's a parking lot almost full of just them. The cars are used to convey conformity, but not just any conformity — a very rational, effiicient, and, on paper at least, a much better kind of conformity. Of course, all these clean Amperas are in direct contrast to the raw, imperfect humans' smoke-belching Granada. This distinction becomes quite key, but I won't ruin things by spelling it out more. So, if you're going to see this movie, keep an eye open for how the cars are used to advance some fundamental messages of the movie. For something that's not a car movie exactly, the cars play a huge role. I can't remember when I've seen cars like this used so effectively, which is a great reason to go see this. In case tubby British guys kicking the crap out of space androids wasn't enough for you.